Picked these two up at the same place and time...and got both E27 and B22d-2 which is unusual. The outer bulb diffuses so well one cannot tell if the tubes inside are linear or helical! The spherical glass bulb rattles loosely in the retaining collar. They have the lead wires arc welded to the base lutes to comply with RoHS decrees. Manufacturer: Brand, Philips, Manufacturer, Terneuzen, Cimpany, Philips N.V.
Current: Not Stated but of high crest factor. Thanks, yes all Terneuzen made stuff was done properly, these are the "real things", not knockoffs! I suspect this closely related lamp, is what these would look like of one could remove the bulbs off them. 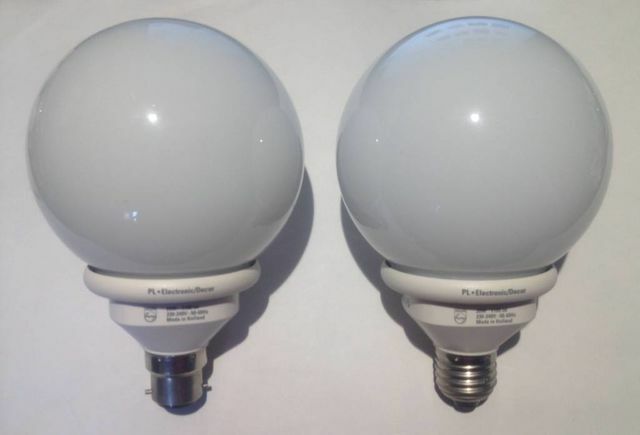 I have 2 Daylight and 3 warm white Philips PL*Electronic D 23W in my collection. They have 3 parallel tubes. There’s something weird about mine, the bulb itself is made in Holland, but the glass globe is made in Poland.